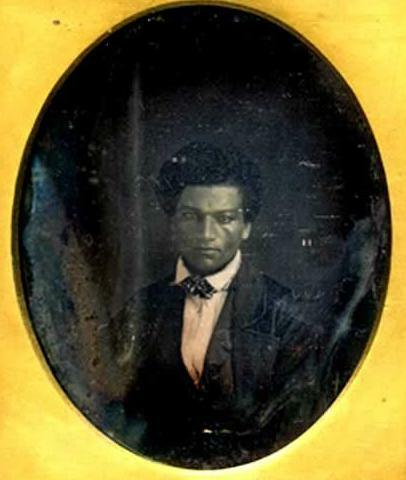 The American abolitionist, Frederick Douglass, in a rare photo taken c. 1840, around the time he became a runaway slave. “To Colonel Lloyd,’ replied the slave. ‘No, sir,’ was the ready reply. The colonel, after ascertaining where the slave belonged, rode on; the man also went on about his business, not dreaming that he had been conversing with his master. He thought, said, and heard nothing more of the matter, until two or three weeks afterwards. The poor man was then informed by his overseer that, for having found fault with his master, he was now to be sold to a Georgia trader…. I’ve got a Frederick Douglass post coming up on my blog too; I think it’s scheduled for Sunday 2/14. I’m almost finished reading Narrative; I have to skip past many of the accounts of the severe beatings Douglass witnessed when he was a young slave. I’ll check out your Sunday post.